The tricky thing about installing the axles is that they require a 0.25 to 0.5 degree toe-in angle. Toe in provides greater straight-line stability and so it's very important to get this right. I should note that I went with Grove wheels so I purchased Grove axles (Grove 1-1/4 axles with wheel pant stub) ACS part # 06-00601. The plans don't provide much guidance with how to achieve this - it more or less states "use a carpenters square". 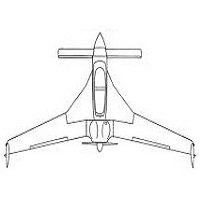 First, I came up with a plan such that I would measure 'A' and 'B' from the fuselage center line instead of what is shown in the sketch above - this way, I can assure that the wheels have the correct toe in angle towards center (doing as the plans suggests guarantees the builder of applying the correct toe-in angle, but does not guarantee an unwanted bias towards the left or the right). So now I needed a way to measure from the fuselage center line. I purchased a laser plane for about $30, applied a plumb bob at the F22 bulkhead and firewall - and presto! Here I am aligning the laser plane with the aft and forward plumb bobs. I made sure the fuselage was level and so was the laser on the ground. Now that I had a laser shooting down the fuselage center line, I inserted two 2x4's - one as close to the strut tips as possible (as close to the axle's fuselage station) and the other located 24" forward of it. Notice the laser marking the center line onto the 2x4's. Using the laser, I marked the center line onto the 2x4's. It was now time to mount the carpenters squares onto the axles. I started out by clamping the axles to the strut tips (axle centered and rotated such that the sides were parallel to the strut - also made sure to leave a 0.25" lip of strut below the axle). In order for the glue to bond to the square and axle, I had to apply a band of masking tape around it. I positioned the carpenters square as flush to the axle as possible and applied a lot of hot glue to it! Notice how the carpenters square laid on top of the 2x4s. After the glue dried, I removed the axle/carpenter square assembly off of the strut and applied a bead of hot glue on the underside. I knew I would later apply a relative large force onto the carpenters square in order to force the toe in angle, so in order to make sure the axle/carpenters square assembly would not fall apart on me halfway through bonding, I applied a tight band of duct tape and zip tied everything together as tight as possible. This might have been overkill, but better safe than sorry! I re-clamped the axle/carpenters square assembly onto the strut and measured the distance from the fuselage center line to the root of the carpenters square (on the aft most 2x4 - the one closest to the axle) and got 27.75". Remember, I'm measuring from fuselage center line (not full span as stated in the plans) - this means I need to be between 0.1" and 0.225" shorter on the forward most 2x4 - so I measured 27.5" from the fuselage center line to the tip of the carpenters square (on the forward most 2x4) and used a clamp to push/hold the carpenters square tip into position. Just to clarify, here's what I'm after - I'm using the forward 2x4 to measure the "A" distance (but since I'm measuring it from the fuselage center line, it's really half of 'A'. I'm then using the aft most 2x4 to measure the "B" distance (again, since it's from center line, it's really half of 'B'). The aft most 2x4 is as close to the axle fuselage station as possible (up against the strut tips). The forward 2x4 is 24" ahead of the aft 2x4. With my measuring system in full effect, it was now time to make the 2.5" x 2.5" x 0.063" square aluminum plates (2024-T3) that go on the inside of the strut tip. Using the band saw, they were cut in 2 minutes. I sanded the inside strut tips as flat as possible so that the plate would rest flush.. I then installed the plate onto the inside of the strut tip... and the axle on the outside... clamping everything together using two clamps. I inserted another 2x4 in the middle to use as the one that holds the clamp that pushes the carpenters square. The forward and aft most 2x4's are the ones I used to measure the toe-in distances. Notice how I used cling wrap on the clamps to keep them from bonding to the strut tip. With the clamps holding everything in place, it was now time to fine tune the 'A' and 'B' dimensions... I moved the carpenters square until I measured 27.75" from the center line to the root of the carpenters square (on the aft 2x4 that was closest to the axles) and 27.50" from the center line to the tip end of the carpenters square (on the forward most 2x4 that was 24" ahead of the other). Here, I am measuring on the aft most 2x4 (the one closest to the axles), 27.75" from fuselage center line to the root of the carpenters square.. I then repeated the entire process for the other side. So if I mirrored everything correctly, I have 55.5" (27.75" x2) as my 'B' dimension... and 55.0" (27.50" x2) as my 'A' dimension - according to the plans sketch. My 'A' dimension minus my 'B' dimension equals 0.5" which is close to the desired 0.45" as stated in the plans. Beauty! Ok... now time to clean up the mess around the strut tips! I uninstalled the strut from the fuselage - I figured it would be easier to clean up the strut tips on the bench, especially when it comes time to trim the forward edges for the brake calipers to clear. To clean up the edges, I used the multitool to get rid of the overhang and then sanded the edges smooth with sandpaper. And presto! The axles are "installed" with the proper toe-in angle. I still need to trim the forward edge of the strut tips in order to clear the brake calipers before permanently bolting them on.